Buddhist Studies: Theravada Buddhism, Myanmar. A Burmese monk or bhikkhu - which means a mendicant - on the daily alms-round. The practice of collecting alms food is a discipline practice by the ordained Sangha, that is monks and nuns in all Theravadin countries. The daily alms-round was practiced by the Buddha and is continued to this day as a means of making merit, by developing generosity, by lay Buddhist and for the material support of the Sangha. The monks set out each day at first light with their alms-bowls and wander silently through the village or town collecting the food for the day. On returning to the monastery they will share the food and usually eat communally finishing their meal - for some monks their only meal - before miday. 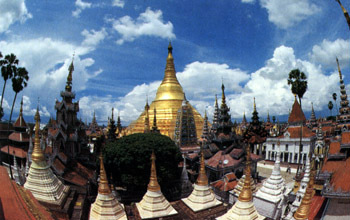 Along with Sri Lanka and Thailand, Burma, recently renamed Myanmar, is a major stronghold of Theravada Buddhism. The earliest written evidence of Theravada in the country is some inscriptions in Pali dating from about the 5th century AD. In later centuries though, Mahayana and Tantra became popular, although the scandalous behaviour of the Aris, the Tantric priesthood, eventually led to the discrediting and finally the disappearance of Tantric Buddhism. In the 11th century AD King Anawrahta (1044-77), converted to Theravada and within two centuries this form of Buddhism became predominant. This conversion of the whole country was helped to a great degree by the flood of monks and books from Sri Lanka. The British annexed lower Burma in the 1820s and finally took over the whole country in 1885 although intense opposition to them, meant that Christian missionaries were unable to make much headway. At independence in 1948 Buddhism once again began to receive state support and today about 89% of all Burmese are Buddhists. In the late 19th century there was a great religious revival in the country, and in this century the teachings of two Burmese masters, Mahasi Sayadaw and U Ba Khin, a layman, have become very influential in the West. 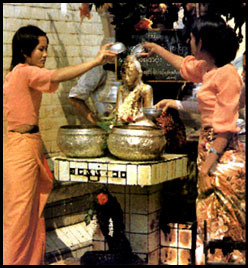 Above two Burmese female devotees pour water over an image of the Buddha at the Shwedagon pagoda in Rangoon. This custom is seen as another way of paying respect to the person of the Buddha himself. As Buddhism is a religion without a God, it might be asked who do Buddhist pray to? Or do they pray at all? The answer is that most Buddhist pray, but they are praying to the Buddha within themselves. They believe that the enlightened nature of the Buddha is their own real nature which they have not yet been able to reach. So when they pray, it is to that deepest part of themselves. In all Buddhist countries the temples are always open, and many people go in during the day. They bring flowers for the Buddha statue or light a candle to show their love and respect. Usually they bow to show gratitude for the Buddha's teachings. Sometime they offer rice or light an incense stick. These are ways of honouring the Buddha. Copyright© 2008 - BDEA Inc. & BuddhaNet. All rights reserved.